Damage-control orthopaedics, Unstable pelvic fracture, Multiple limb fracture, Application effect. From a clinical point of view, unstable pelvic fracture is a common medical orthopedic disease. As a serious disease, it can easily lead to multiple limb fracture, which causes great harassment to patients to some extent, affecting their life and health. Therefore, timely and effective treatment must be adopted for the disease. Study shows that orthopedic injury therapy enjoys very significant therapeutic effect for unstable pelvic fracture complicated with multiple limb fracture, with relatively good clinical application effect achieved [1,2]. In this paper, in-depth exploration and analysis will be given, specific treatment measures will be emphatically explained to provide a reference basis. The specific report is as follows. In this study, the 1,200 patients with unstable pelvic fracture and multiple limb fracture admitted in a hospital from March 2010 to March 2016 were randomly sampled as research objects. In the reference group, there were 350 male patients and 250 female patients, who were aged between 20-59 years with average age at (37.6 ± 2.5 y); in the experimental group, there were 280 male patients and 320 female patients, who were aged between 22-62 y with average age at (38.5 ± 2.8 y). There was no significant difference between the two groups in the basic data, and the difference was not statistically significant (P>0.05). All patients selected in this study enjoyed the right to know and signed informed consent. This study has obtained the approval of ethics committee of our hospital. The reference group: Treated with conventional treatment regimen. The experimental group: Based on the conventional treatment, damage-control orthopaedics was applied. The specific measures are as follows: First, the patients were sent to operating room immediately, effective control measures were given to patients with massive haemorrhage. Meanwhile, the patients were given blood transfusion therapy and infusion therapy, which could prevent patients from shock. After completion of debridement treatment, stent was used for fixation. For patients with severe arterial loss plus visceral loss, laparotomy was a must. The patient with multiple fracture must be treated with a simple fixation; Second, the patient was sent to the intensive care unit for effective resuscitation. Meanwhile, the patient was rewarmed to ensure their stable hemodynamics and help their blood volume recovery. It is worth noting that, effective correction must be given to patients with acidosis symptoms, so that blood clotting mechanism recovery speeds up. Also, respiratory adjuvant therapy should be given to effectively lift their ventilatory disorder; third, the patient was then sent to operating room, with internal fixation for limb fracture (Figure 1) position based on the actual situation after the patient's life indicators restored stability. After the patient's condition becomes stable, pelvic fracture can be reset when there is no contraindication in operation, followed by internal fixation [3,4]. Figure 1: Schematic diagram of multiple limb fracture . Treatment efficiency of the two groups was compared with the evaluation criteria: Matta. For separation shift distance exceeding 20 mm, efficacy is inferior; for separation distance between 10-20 mm, efficacy is common; for separation distance between 4-10 mm, efficacy is good; for separation distance below 4 mm, efficacy is excellent. Good rate=(excellent+good)/total case number × 100%. In this study, the new statistical software package-SPSS19.0 was used for the data analysis and processing. Count data were expressed by (n, %), with chi-square for test; measurement data were expressed by mean ±, average value (x̄ ± s), with t for test. With P<0.05, there is statistical significance. According to the results of the study, the effective rate was 95% (570/600) in the experimental group and 73% (440/600) in the reference group. The experimental group had significant advantages compared with the reference group, p<0.05, there is statistical significance. Seen from the treatment feedback, the experimental group had 2 cases of complications, respectively urinary tract infection, sciatic nerve traction injury, with incidence of complications at 3%; the reference group had 10 cases of complications, including 6 cases of acute respiratory syndrome, 2 cases of venous thrombosis, 2 cases of subcutaneous soft tissue infection, with incidence of complications at 17%. Comparison between the two groups meets P<0.05, there is statistical significance. Analyzing from the current situation, unstable pelvic fracture (Figure 2) is a common orthopedic injury for basketball players, which is often complicated with multiple limb fracture. As it seriously affects life and training of patients to some extent, timely effective treatment program must be taken. In the past clinical treatment, conventional surgical treatment (Figure 3) was usually adopted for these patients, but the clinical effect was insignificant, treatment efficiency was low, and patients were prone to complications. In recent years, damage-control orthopaedics has been applied to treatment of unstable pelvic fracture complicated with multiple limb fracture, with good application effect obtained and scope of application gradually widened [5,6]. In damage-control orthopaedics therapy, phased treatment model is usually taken. First, we should ensure that patients’ vital signs return to normal, and then apply surgery on patients. This therapy can achieve good curative and rehabilitation effect obtained, and thus should be recommended to be promoted in application in the future clinical treatment. Figure 2: Schematic diagram of unstable pelvic fracture . 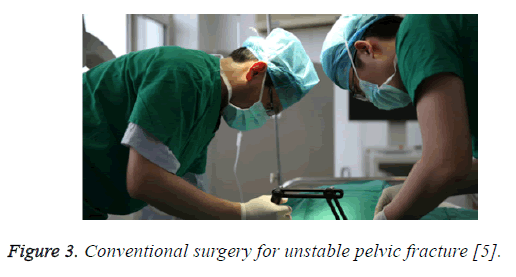 Figure 3: Conventional surgery for unstable pelvic fracture . In this study, the experimental group were treated with damage-control orthopaedics based on conventional treatment, which received excellent treatment effect judging from the research data feedback, with treatment efficiency at 95%. There was significant advantage compared with 73% of the reference group. Comparison between groups meets P<0.05, with statistical significance. In addition, the experimental group had 2 cases of complications in the course of treatment, with incidence of complications at 3%. Nevertheless, the reference group had 10 cases of complications, with incidence of complications at 17%. Thus, damage-control orthopaedics enjoys good application value in treatment of unstable pelvic fracture complicated with multiple limb fracture. To some extent, injury control theory is a treatment theory based on practice, which mainly targets at patients with severe trauma and great blood loss and body fluid loss. In the course of treatment, patients’ basic situation should be taken as a reference, their physiological tolerance should be considered, and then phased treatment can be carried out. The purpose of the treatment is to protect patients’ life safety. Clinical recovery and intensive care should be carried out with appropriate treatment measures. After patients’ indicators tend to be stable, definitive surgery can be implemented to promote patients’ early rehabilitation [7,8]. In general, phased treatment program is taken for damagecontrol orthopaedics therapy. First of all, hemostasis treatment should be done for wounds of patients, especially patients with multiple limb fracture whose wound must be immediately cleaned. Blood volume should be replenished for patients with hemorrhagic shock. For patients with closed fracture (Figure 4), the medical staff needs to apply plaster for external fixation, or conduct traction for temporary fixation. For patients with more severe fracture, amputation is needed. In short, treatment goal is explicit in the first stage, i.e. to stabilize patients’ vital signs; in the second stage, the doctor needs to conduct a comprehensive assessment of the patient's injury to determine whether the patient needs to stay in ICU; finally, in the third stage, the final treatment plan should be determined based on the patient's vital signs, as well as the related experimental data indicators [9,10]. Figure 4: Treatment measure for closed fracture . Unstable pelvic fracture, as a serious clinical bone disease, must be given high priority. Easily leading to multiple limb fracture, it not only causes great distress to patients’ life, but also has a very high disability and mortality rate. Thus, effective treatment program is given to the disease in the clinic. The study shows that damage-control orthopaedics can effectively treat unstable pelvic fracture, and moreover, reduce incidence of complications to some extent and improve clinical treatment efficiency. In this study, objective research results were obtained through experimental data analysis. The study results basically coincide with views described by many scholars. Thus, damage-control orthopaedics therapy enjoys great clinical value in treatment of unstable pelvic fracture complicated with multiple limb fracture. The damage-control orthopaedics therapy should be widely promoted in the future clinical treatment. In general, unstable pelvic fracture complicated with multiple limb fracture poses a great threat to life health of patients. Damage-control orthopaedics therapy in the clinic can achieve relatively effective treatment result, and moreover, reduce incidence of complications to some extent. As a relatively effective and safe treatment measure, it is worthy of clinical promotion. Shao X. Application e effect of damage-control orthopaedics on unstable pelvic fracture complicated with multiple limb fracture. Contemp Med 2014; 25: 36. Chen W. Application effect of damage-control orthopaedics on unstable pelvic fractures complicated with multiple limb fracture. Contemp Med 2014; 30: 11-12. Liu P, Wang Y. Observation of application effect of damage-control orthopaedics on unstable pelvic fractures complicated with multiple limb fracture. J Clin Med Lit 2014; 6: 930-932. Jin C. Application effect of damage-control orthopaedics on unstable pelvic fractures complicated with multiple limb fracture. China Health Stand Manag 2015; 24: 63-65. Li M, Li J, Liu B. Application effect of damage-control orthopaedics on unstable pelvic fractures complicated with multiple limb fracture. China Med Eng 2015; 10: 148-150. Zheng B. Comparative pharmacokinetics of a proliposome formulation of Ginkgo biloba extract and Ginaton in rats by a sensitive ultra-performance liquid chromatography-tandem mass spectrometry method. Saudi J Biol Sci 2016; 23: 54-65. Jiang HB, Tang K, He XL. Experimental studies on reduction of evaporation from plain reservoirs in drought areas by benzene board covering technology. J Coast Res 2015; 177-182. Halici U. A retrospective comparison of early results of isolated coronary artery bypass surgery in young (<40 years) and middle aged (40-60 years) patients. Acta Medica Mediterranea 2015; 31: 807-811. Cantarella G. Clinical case: fatal multi-organ left ventricular embolism in a patient with beta thalassemia major undergoing endovascular treatment for stenosis of the sub-renal abdominal aorta. Acta Medica Mediterranea 2015; 31: 1019-1021.